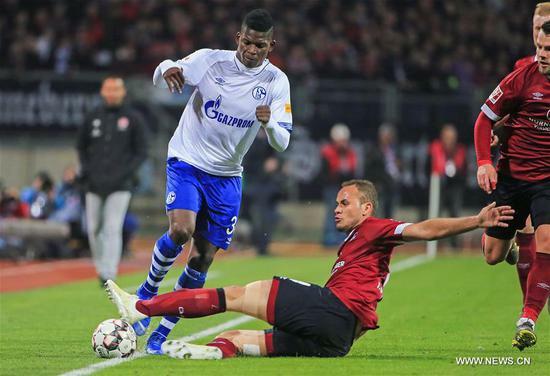 BERLIN, April 12 (Xinhua) -- Matija Nastasic's late equalizer rescued Schalke a 1-1 draw with newly promoted Nuremberg at the curtain raiser of the 29th round in Bundesliga on Friday. Relegation threated Nuremberg staged a powerful performance but a saved penalty and a last-grasp equalizer by Schalke left the newly promoted hosts with just one point. In the first half, goal-scoring opportunities were at premium as both sides were cautious and focused on a well-positioned defense. The encounter sparked into life just before the break when Schalke's goalkeeper Alexander Nubel fell Matheus Pereira inside the box to concede a penalty. Nuremberg's team skipper Hanno Behrens stepped up but saw his effort from 11 meters tipped around the right post by Nubel, who ensured a half time on level terms. After the restart, Schalke came out highly motivated but yet they lacked in ideas to threaten Nuremberg's bulwark. Meanwhile, the hosts tested Schalke's custodian twice but neither Matheus Pereira nor Sebastian Kerk were able to break the deadlock. Nuremberg's efforts eventually paid off in the closing period as Yuya Kubo headed home a delivery from Matheus Pereira to open the scoring in the 82nd minute. However, it was a short-lived joy for the hosts as Schalke bounced back out of the blue only two minutes later when Matija Nastasic tapped home a corner to flabbergast Nuremberg. "We staged a poor performance. I am not satisfied with both halves. That wasn't enough. We did not perform well," Schalke's interim coach Huub Stevens said. "We had a lot more chances. There should have been only one winner today," Nuremberg's Behrens said. With the draw, Nuremberg stay on the 17th position, which is a direct relegation spot, after securing their second straight share of the spoils. Schalke ended their losing streak but remain on the 14th place of the standings. The following fixtures are scheduled for Saturday: runner up Borussia Dortmund host Mainz, Leipzig see Wolfsburg, Stuttgart face Bayer Leverkusen, Werder Bremen encounter Freiburg and Hannover clash with Borussia Monchengladbach.